I'm not sure exactly which mall or shopping center this would be. All I have to go on is that the photo was taken in a shopping center in Riverside. I haven't had a chance to look into it further. Charming shot, though, wherever it was taken! 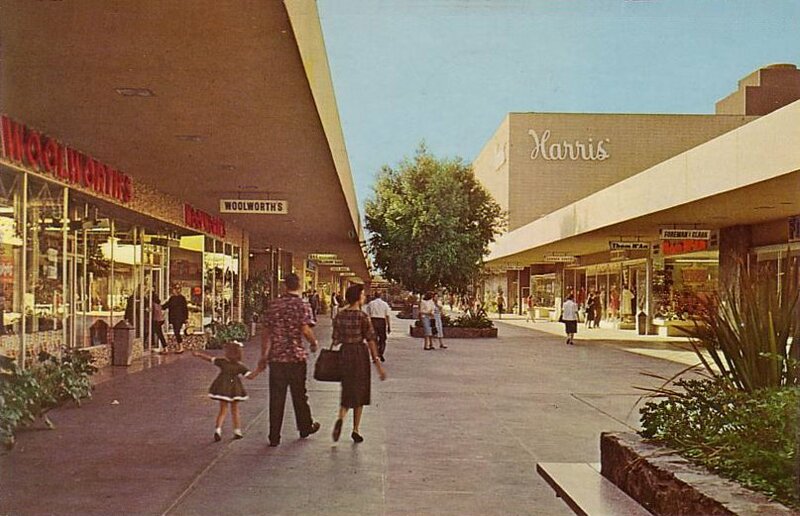 You can see a Harris' on the right and a Woolworth's on the left, with Mom, Dad, and Daughter, walking the promenade hand-in-hand, in fine '60s nuclear family fashion. Update: Thanks Kayla, and Christopher Boese, for identifying the photo as the Riverside Plaza! I appreciate the help. This is the Riverside Plaza. Back in the 80's this mall was inclosed, and recently torn down and rebuilt as an outdoor entertainment area. However Harris still remains (Gottschalks). I bought my prom dress at Harris Co.--40 years ago! A picture of this same Harris store in 1999. I haven't been back to Riverside Plaza since, and I'm not surprised that it was torn down, since it was mostly empty then. We had a mall like that here in Connecticut called th Connecticut Post Mall. It was an open air mall with an open coridore down the middle with acess to the stores. You could reach the stores from the parking lot too. With the hard winters we have here in Connectict the obvious thing to do was to put a roof on the place. Westfield got involved at some point.. Alexander's left and JC Penny Arived. Today it is the stupidest looking mishmash of add-ons and build overs. I never go there... It gives me a headache just to drive by it. Thankls for havien this site! I remember when this shopping center looked like this... I lived about 3 blocks away. Also in this center was a Grants Department store. Where I used to buy 45's for I think about 40 cents each. The Woolworth had a soda fountain inside. Other stores were ThomMcAnn and Kinney Shoe stores. I love the picture. I wanted to post a picture of how it looks now, but I don't know how to post it to the site. This is remarkably similar to the mall I went to growing up, called Stonewood Center in Downey (also in Southern California). It had a Broadway and JC Penney on either end, a Woolworths, and many other stores. I was there just about every weekend with my mom & aunts. It was also used in an episode of The Wonder Years. It was enclosed in the late 80s, and now is just a rather generic, nothing-special mall. But I have so many fond memories of being there as a child...and there was also a Farrel's Ice Cream shop! Wow, I love this pic. I grew up in this little plaza, bicyling through it on Sundays when all the stores closed for the day. (Anybody remember those days?) Both of my uncles had ladies' fashion stores there, and my grandmother had a gift shop down at the other end of this picture by the Rexall Drug store. I spent a lot of time at Woolworth's and WT Grant's and O.K. Hopkins record department. Anyone around remember Mayfair Market, Builder's Emporium, The Dunes restaurant, and Engleman's Mens Wear? Geez, stop me. I could go on for days about this place. You could bicycle from here to the Brockton Arcade and Doug Gillette's record store to get your 45's. Anyone got a shot of the Brockton Arcade in the 50's or 60's? I'm late to this string, but to answer bubba g, I have very vivid memories of the plaza in the era you recall. My Dad was the manager of the C.H. Baker shoe store, just in front of the Harris Co. in this photo, from 1960-1966. Like bubba, I remember Mayfair, Builder's Emporium and the Dunes (my Dad was good friends with Ross Browning, owner of the Dunes), along with the Rexall Drug Store and the Copper Penny coffee shop (across from Harris's towards the drug store on a little aisle between the central 'plaza' and the parking lot along Central Ave.). Needless to say I have very fond memories of this place, particularly during the Christmas season when Harris's had these incredible animated window displays with elves, raindeer, Santa and all sorts of Christmas elements. We used to go down on a Saturday night (when the stores were closed in those days) just to look at the beautiful displays in Harris's windows. Anyway, thanks for bringing back fond memories. Wow, that's great. I had no idea there would be someone out there that knew of the "old" Riverside Plaza. I remember the Brownings. I was in Marilyn's class at Poly. And I remember having a LOT of cheeseburgers at Copper Penny. They used to bring over all the sugar bowls for me to build forts with the wrapped sugar cubes. Consequently they would sit us in the back room quite often. Everybody would just shake their heads. You know how kids can be. I used to love Xmas at the Plaza, but I liked it particularly downtown with those great big foil overhangs on Main St before the mall went in, and carolers going from store to store (in my eyes, it WAS Norman Rockwell...but without the snow). My uncles opened their first stores down there, and I remember Xmas was just so festive there (in a 50s sort of way). I'm getting carried away, but this is a blog, isn't it? Makes me wish I knew a place like this in my hometown. The Riverside Plaza, now in its 3rd incarnation, is once again an open-air plaza. The following link includes a photo gallery from demolition to rebirth. I've seen this post card before in a whole book on Riverside History through postcards. Ironically, I bought the book in the new Riverside Plaza at Borders Bookstore. I love what they have done with the new plaza....it was empty and desolate for years, but I miss it in the hey days. I'm glad to see other people remember it. Especially the christmas displays in Harris' window. It was the hightlight for kids living in Riverside County back then. Does anyone remember the Sages store that was a block away? It's now Alin Paper company. Also, as an adult I spent a lot of time at Carlos OBriens for night life. Thanks for this. I grew up about three blocks away from the RivPlaz, and would often ride my three-speed over to the Woolworths (at left in this photo) to look at the turtles and parakeets. As another commenter said, there was also a WT Grant in the Plaza - loved to get cherry freezes there in the summer, and many of my school clothes came from Montgomery Ward when it took over from Grant's. A dirty old man tried to pick up 5-year-old me in the liquor department of Mayfair (where I was perusing the comics racks). Got out of that one! A couple of blocks away was Sage's, another sorta department store that had a bell tower and carillon bells, as well as a fabulous-fifties iteration of Baskin-Robbins (back when it was called 31 Flavors). In high school, a number of my friends worked there, which meant free ice cream and motorcycle rides around the parking lot after 31 Flavors closed for the night. I'm long gone from Riverside, but on a recent trip back I went to the latest version of the Plaza - it's now open-air again but not very pedestrian-friendly. Harris (now Gottschalks) is the only remaining original building...they have a really ugly multiplex now, and a bunch of generic "fancy" chain restaurants with names like Chipotle. The only good thing about the new Plaza is a Trader Joe's, but I still have my memories of riding that three-speed around the two-story parking garages at the Plaza. Anyone who is nostolgic from this post card should check out Bill's website of things that aren't there anymore. This was a mall that everyone's life was changed, it was America ina dirrerent time& space, made richer with memories. I grew up with the man who built the Harris Co. Christmas window displays - his name was Don Nabours, c: 1920 - 1974, San Pedro, CA was his studioo. He was a Disney artist in 1930 who worked for Walt Disney for $3.00 per day. By 1950 the Harris Co. family met him and commissioned him to do the San Bernardino Harris Co. and were so impressed they commisisoned him for all their stores by 1956. I still have his figures in my garage fromt Harris. OMG Anonymous! You are so lucky to have been able to keep those figures from the Harris' Xmas window. You've got a wonderful piece of SoCal history there. Hey "Anonymous". You are not Gary by chance? I grew up in Riverside and refurbished, cleaned, and set-up the Harris' Christmas display window in Riverside for several years when I was only 13 years old thru age 18. I met Don's ex-wife after his passing away (I was 10 years old). She gave me all his drawings of all the different Christmas display scenes he created. I met a guy named Gary a few years later who was sort of Don's apprentice. I wish I would have stayed in touch with him. Do you have any photos of the old displays at Harris'? It would be great to talk to you! My Dad Harold Heers built the Riverside Plaza and at one time my brother Harold Heers Jr. remodeled it and owned it. It reminds me of a time when life was very innocent.Dad is still building and is going to be 92 in March. I am doing a biography DVD on his life now and if you have any old photos or memories I would sure appreciate them. Yes, it's the old Riverside Plaza. What brought me to the site, was, I was trying to find Ross Browning's son, Ross Jr. We went to school in the same class at Notre Dame, but I've lost touch with him. I noticed that one of the posts was written by someone who was in Marilyn's class at Poly, (maybe they know something). I am pretty sure that both the parents are at Olivewood by now. We used to love going to the Dunes Restaurant, and before that, the White Sands....There was (I think), the original Marie Callenders' across the street on Merrill, and we had an optometrist named Dr. Carl Click somewhere near the White Sands. Also, GKC was a really upscale (chic) women's store near Thom McAn shoes. I also seem to remember buying cub scout uniforms at Harris'. Does anybody remember Delia's Grinders over by Sage's on Magnolia? I could add a lot more, but it's 4:05 in the a.m., and I'm knackered.... DCGW..If anyone knows anything about the Brownings, I'd like to hear from you. My tel# is 650 559-0774 in Los Altos, CA. Thanks! I found this site the other day, and it is fantastic. It is too bad the plaza has been destroyed. The vintage pic shows those fantastic lighted signs that hang perpendicular to the walkway so you can see what store you are approaching. While these were once common they don't do such curtious things anymore. I'm in the design field and find vintage design inspiring. keep the pictures comming. DCGW, I had forgotten the old name of the Dunes as being the White Sands then. But I'm afraid I don't remember much about Ross Jr. Marilyn was in my class at Poly but we were mostly just acquaintances so I can't offer any more credible information. GKC was my Uncle Glenn's store and Kristy's was my Uncle Richard's store, both of them descendants of the old Mode O'Day company which was started up by my grandfather Christensen from Utah and my great uncles Malouf who emigrated from Lebanon. I remember the Plaza very well as I just lived on the "other side of the tracks" off Elizabeth and Lawson. I spent a great deal of time there just hanging out cruising on my bike (especially on Sundays when no one was there and all the stores were closed). Now that's a blast from the past! I do have a question though. Wasn't Delia's over by Brockton Arcade on Nelson and Magnolia across from Palm School? I also believe that the Marie Callender's was originally Sir George's smorgasbord wasn't it? That whole side of Merrill used to be an empty lot from Riverside to Magnolia. We used to board the Santa Claus train there at Christmas time. It would take us on a ride to Yucaipa (the North Pole obviously) or something like that and Santa would come through the cars loaded with kids and hand out candy canes. Then came the drive-thru dairy and one of Earl "Madman" Muntz's first audio stores. OMG, I must stop! This is killing my brain! QUESTION, Did Harris have an in-store department store ? If so, what was the name of it ? This site is so wonderful. I wish we had more downtown department stores...etc. today ! There were a few of em actually. The original location (which is still there actually...remodeled though) is on the corner of University Ave/Kansas. There were three others through the years as well. Arlington/Van Buren, Magnolia/Nelson, and another on Van Buren out in the Woodcrest Area. Hello Riversiders. I live in Bowling Green, Kentucky now and it reminds me of Riverside when I was a kid. Yes, I also went to the Plaza. took the city bus. My Mom worked at the White Sands and then the Dunes for nearly 30 years. I also had a job there when I was 15. Remember Orange Julius? Copper Penny, I think I learned the do math counting our pennys for a cherry coke and burger. what a good life. Do you remember Taco Tia? Taco Tia closed in Riverside - they tore it and the Cactus down on Van Buren for to widen the road. We're down to 1 D'Elias, run by the same family. The original Marie Callendar's was torn down and replaced with a nicer one. Remember Cheney's Music Store? And Tuxie's - which is still there (I think). My mother loved shopping at Christie's. Oh, and the Dunes was at Riverside Plaza, but White Sandas was on the other side of the railroad tracks. And who could ever forget Sage's Strawberry pies? Pachappa School was across the street from Builder's Emporium. I lived on Tipperary Way and kenw every household on the street. I often wonder what happened to the students at Pachappa School 1957 - 1964. They were al wonderful people I dearly loved. Reflecting, I happened upon this and it brings back memories. How many comments there are about the Brownings, The Dunes and Marilyn & Ross Jr. St. Catherine's will never be the same without the Brownings nor Pete Lanzi and so many others. I can taste the best grinders at Delia's. How many times have I tried to explain the grinder to other shops? Marilyn is married to her Poly High classmate and they entertain in Las Vegas. I moved to Riverside in 1983 and love the history of the city. Iwas watching the 1964 film by William Castle "Strait Jacket" with Joan Crowford and noticed in one sceen they drove past the Mission Inn and went shopping and in the background (thanks for DVD slow motion), I noticed Woolworth's, Gallenkamp Shoes, Grants, Irene's Beauty Salon, and had to find out where this was I was unable to find any infornation where the movie was filmed. But this photw was the street that was in the movie. I have loved this classic movie and was excited that it was filed in Riverside, CA and I believe the farm dairy seen was shot in either Corona or Norco, CA. Hope to see other photos of 1950's and 1960's riveride posted here. That is me, with my mother and father!!!! I was shocked to come across this picture. I am 44 years old now, and I look to be around 4 in the picture. 1967! I still live in Riverside across from the Plaza!! I have very fond memories of the old Harris Co. Campus Deb club of the early 60's. We used to meet at the DeAnza theater for a fashion show and a live band, often the BEACH BOYS before they were well known, and usually a "star" like Paul Petersen of the Donna Reed Show. We'd return to the Riverside Plaza for autographs after the show. Great times. super bummed taco tia and the cactus closed.used to go there from arlington h.s. for the wednesday special all the time. Wow - I'm very glad to have run across this post and so many people that remember the old Riverside plaza. My dad was promotional manager for the plaza (and Sage's) during throughout the 60s so my sisters and I had the run of the place. John Robert Powers - a modeling agency which was across from Woolworth's as I remember. Since my dad was in promotions, I remember all the cool things that happened at the mall. For instance, around 1966, the plaza together with a local radio station (I forget the call letters) sponsored a parade and the big attraction was the Batmobile. Funny thing was, it had some sort of mechanical problem and finally had to be towed through the streets. One of the biggest thrills I remember was having lunch with the cast of Giligan's Island at The Dunes when they were out for some public appearance. Does anyone have other pictures of plaza (particularly The Dunes) - or know somewhere they might be posted? Harris Gottschalks sadly isn't there anymore, went out of business and is now a large-format "FOREVER 21" 3-level store, luckily i went there during the last days it was open and sneaked some pictures of the inside, remarkable store, i love it when stores have 3 or more levels! Geeze Dawn Heers kinda modest aren't you , you and your husband HWHeers jr. owned this mall at one time. I spent way too much time sitting on the planter area in the photo. Riding Honda 50s around the parking lot. I had completely forgotten about Sages. Sages toys was across the street in a separate building. Can't for the life of me remember the name of the toy store by the Mayfair. I had a couple good friends (brothers) that lived on Riverside Ave just off Jurupa. Again thanks for the memories. It used to be a great place to hang out! Karmel Korn, O.K. Hopkins, Mayfair Market, Builders Emporium, The Joke Shop, Orange Julius, Woolworths, Harris', The Dunes, Don Cree LTD, Copper Penny, Kinneys, Thom McCann, Grants, Englemans...All in the original Riverside Plaza. Gilettes Records was located in the Brockton arcade (about a half of mile west of the Plaza. Loved KarmelKorn and Orange Julius. I remember when Orange Julius introduced Strawberry Julius. I was very confused. I think the joke shop was actually called The Joke Shop. It was run by a grouchy old codger who seemed to make a living selling hand buzzers and fake snapping gum. Does anyone else remember the Little Professor Book Shop? I worked at the Dunes back in 1974...what wonderful times .. The joke shop near the Little Professor book store was called Fun n Stuff! And yes, the old goat that owned the place was mean to all kids and just stare at you but you had to buy stuff because he had the coolest things! Later in 1985, I started working for Harris" until 1991,then I started at Nordstrom in the newly rehabbed Tyler mall. It was a down hill slide from that point on for the Plaza. When I was 12, about 50 years ago. I remember riding my bike to the plaza to see the Beach Boys play I think it was the opening of a new store, It was in the moring about 10 or 11:00 they loaded and unloaded ther own equipment and there dad was there does anyone else remember this?? I will never forget the glazed donuts Mayfair Market sold. I can still smell them. I grew up in Riv also. My folks bought there in 1961 when my pop got stationed at March AFB. Looking for old pictures of the Copper Penny that was in the Riverside Plaza.. Any suggestions? My mom worked there for about 5 years when we first moved to Riverside back in 1964.. I remember they would always close off the back dinning area for my mom to have Birthday partys for my sister and I.
I remember going in there to the back of the store where records were with my aunt when I was about 9. They had these little sound booths where you could put on headphones and the clerk would put on a record so you could preview it. Blue raspberry slushes at the Karmel Korn. The smell was heavenly when the tumbler was mixing in the front window. Sage's was awesome. Way before it's time. They had everything there. I still have a doll I bought there with my saved up 50 cents a week allowance (46 years later). Got my first taste of peanut butter and Bacon on toast at their cafe. The old lady clerks at the toy store use to stand at the end of the aisles to stare at us like we were going to shoplift something. I recall when Harris opened and they had an ESCALATOR! WHAT!? I rode that thing just to ride it! I also recall the Santa Claus Christmas train, which actually went to the crest of Cajon Pass, not Yucaipa (that would have been Southern Pacific). Anyone recall OK Hopkins, the record store? You could go into litle booths and listen to records to decide if you liked them. The clerk would play them for you. Yikes, I'm old! Thank you everyone for the wonderful memories of the Riverside Plaza. Like a lot of you, I was born and raised in Riverside. I too have wonderful memories of shopping at the Plaze. My grandmother worked at Moran's Drapery Store. I think it was next to Orange Julius and thank you to the person who also remembered Sages Toy Store. I recently asked my parents if they remembered it, and they didn't so it was good to hear someone mention it. Wonderful stories and memories. Wish we could go back !! I remember the Riverside Plaza but remember the Tyler Mall even better as I grew up directly across the street from the old Farrel's Ice Cream Parler. Our house was located exactly where today's McDonald's stands. I remember hearing the ground shake when a train would go down the middle of Magnolia Ave. to drop off lumber at Windship's. I watched the watermelon field across from my house transform into the Tyler Mall. I also worked on the construction of the then $40million dollar mall with the Broadway and May Co. Stores as anchor tenants. I saw all of the development in that part of Arlington from the 1950's until when I left in 1966. Wow, what crystal clear memories! Forget about high school reunions-one needs to be organized for you bloggers to attend!! Heers Bros. ahead of their time in 1950s when Plaza was built w/ mostly locally-owned stores who took a big risk! Where is Harold today? Brothers? Don Basket remembered...he organized an Easter bonnet parade! GKC taught me fashion. Those were the days...great days. Interesting there are so many shared good memories. The times really were great!!! Does anyone remember Party Time by Grant's? Owner Don Jeffries' son, Mike Jeffries, is CEO of Abercrombie & Fitch. Anyone remember Gallenkamp's, Leeds, Paul Allen, Florsheim (lots of shoe stores), House of Fabrics, Lerner's, Morrow's Nut House then Party Time, Pace, Green & Christensen Jewelers, Plaza Toyland, Riverside Travel, Motherhood Maternity, Bill's Shoe Repair, Plaza Barbershop, Plaza Stationers, Mardon Jewelers, a bakery then Samples 'n' Stuff, the junior store at GKC with Marty...56stores I remember the ads saying so we've missed some! Don't forget Richard's (? ), the credit jeweler who had a window display cram-packed with all kinds of rings, watches, necklaces etc. with cards showing how much the weekly payment would be. . .like 99cents or something cheap!!! As a manager at the Kay-Bee Toy Store in the early '80's (I know, I know, a bit late for the time frame...) we had a basement in our store that connected, through a dark, spooky boiler room, to what was apparently a storage room for what used to be known as Harris & Frank, which was later shortened to Harris'. I was a teenager in Riverside between 1960 and 1964. Went to Chemawa Jr. High and then on to Ramona, before moving to Long Beach in 1964. My neighbor and I often rode our bikes to the Riverside Plaza, just to hang out, go to the record store and ride the elevator inside the Harris Department Store. We often stopped at the Brockton Arcade where there was a pretty cool hobby shop. When my family first moved to Riverside from New Jersey, my father took me to the Forman and Clark menswear store in Riverside Plaza to get some new school clothes, and then on to Thom McCan's shoe store for my first pair of penny loafers. Right across Magnolia from Sage's was Bill's Hobby Shop, another great place to hang out and watch the model railroad that Bill was building in the center of the store. My friend and I also would ride our bikes to the Java Lanes for an afternoon of air comditioned comfort and few lines of bowling. When he got his car at age 16, our venues expanded to Corona(pre mall), March Air Force Base the downtown movie theaters. Does anyone remember what the restaurant was before it was Carlos o Briens? Fun memories. I'm not a fan of how it has been transformed. I remember a couple of stores not previously mentioned. See's Candy across from Harris Co and Mardon Jewelers where our wedding rings were made in 1972. Old Riversiders, there's a fun facebook group called We Grew up in Riverside In the 50s and 60s. If that's you, look into joining us. Someone was looking for Ross Browning. You can find him there. Also, whoever said they were in Marilyn Browning's class at Poly, l was 2 years behind you. I also grew up quite close to the Plaza and have many happy memories of being there.